You Save: ₹ 12100 (33%). For limited period only. It may end soon. It's a No Questions Asked Policy! Books should be dispatched within 15 days of receiving them. In case of Test Series, it's after attempting 3 Tests. You should Not use a pen on books. We shall refund your 100% Fee in your account on receiving the books except Rs 200 Courier Charges. Once you Buy a Course from us, you do not need to purchase the same course in any subsequent attempts. You just need to subscribe to the latest current affairs notes at a subsidised fee. We shall send you all the changes that have taken place in the Static Area/ Traditional Areas in a Separate Booklet along with current affairs. So you don't have to buy the same course again and again if you have to appear in multiple attempts! "MY UPSC JOURNEY BEGINS WITH YOURS HOPE END IT WITH YOURS TOO I FIRMLY BELIEVE IN YOUR MAINS NOTES..MY SINCERE THANK YOU FOR ENTIRE TEAM OF CRACK IAS..HAVE HOPES YOU GUYS STAND NO 1 POSITION V.SOON IN TERMS OF PROVIDING QUALITY MATERIALS FOR ASPIRANTS AS PER UPSC STANDARD." "CRACK notes are a store house of knowledge. They are handy and in note format. I admire it is the special notes for GS Prelims and found it was very useful. It acts as a ready reference, very valuable and also time saving. It is well covered, comprehensive and nicely presented in a readable manner. Crack notes are good coverage for Prelims. In my view it is a highly valued for Civil Aspirants." GS MAINS(9 BOOKLETS) for All Four Papers At the time of Subscription. Comprehensive yet very crispy - No need to study anything else! Anything else means Anything Else! Consistent performance - 75+ Qs. (out of 100) every year in Prelims since 2007. We have Never Failed, We will Never Fail! Every News Counts and we make sure you don’t Miss Any! Our Current Affairs Booklets cover News from 14 Relevant Sources incl. PIB, The Hindu, ET, PRS Blog, Live Mint, Government Sites etc. Our Synopsis of India Yr. Book & Eco Survey in about 150 Pages has never missed even a single Q. since 2007. Best Self-study Notes: Don't waste your Time making your own notes. Read these Booklets again & again. Use your time to Practice Questions. Personal Notes of IAS Topper who scored highest marks in GS Mains - originally written by him with real time update. Complete & Crispy - Each and every topic - Minor or Major - of all the 4 papers of GS Mains - covered completely with all relevant facts and analysis. Topical Current Affairs: we have divided the whole Mains syllabus into 320 Topics. You will get Topic-wise well-prepared Current Affairs of Last 1 year against these 320 Topics. So you can supplement respective Static Topics with relevant current affairs- for best results in Mains. Best Self-study Notes: Don’t waste your Time making your own notes. Read these Booklets again & again. Use your time to Practice Answer Writing which is most important for Mains. Most important purpose of Tests is that you are able to understand the essence of a question/ the trick involved in it and why this question was asked. Our Test Series provides the “Essence of Every Question” separately at the end of its explanation. 100% Feel of UPSC, Guaranteed! Test series exactly on UPSC lines. Very tight evaluation against 1000s of students on UPSC lines. Best Test Reports against 11-Qualitative & Quantitative Parameters - that diagnose your problems and help you improve your performance. Test Series made from the Best Sources incl. NCERTs/ PIB (from where UPSC asks questions) by the brightest minds. Only Test Series which includes min. 25% Qs of Current Affairs in its each test. What is there in GS Prelims Package? In our GS Prelims package, we have 5-Booklets of Static areas like History/Art Culture, Polity, India/world Geography, Economy, Science & Technology, and Environmental & Ecology. 3-Booklets covering current Affairs for period of 1 year, compiled from daily basis & 1 synopsis of India Year Book in 200+ pages. You will get online 5 full length subject wise Tests & Monthly Current Affairs E-book of preceding month. In 9-Wonder Booklets, do you cover all NCERTs & how they are covered? In 10-Wonder Booklets, we cover 6th to 12th old & New NCERTs & 70+ major books like Laxmikanth, DD Basu, PM Bakshi, & more. In our booklets we have a gist of all 6th to 12th old & New NCERTs, most of the Imp content is given in Bulleted, Tables & Flowcharts. How these 9 Booklets distributed and what all has been covered? In our booklets we have first 5-Booklets of static areas which covers 6th to 12th old & New NCERTs & 70+ other sources like Laxmikanth, DD Basu, PM Bakshi, & more. 3-Booklets of Current Affairs which covers 14+ major sources like The Hindu, PIB, Indian Express, ET & more on daily basis. What is the volume size of your each booklet? The Volume Size of each Booklet is 275 average pages. What is the UPSC Syllabus for GS Prelims? - Indian History (ancient/medieval/modern) and Indian National Movement. - Indian Polity and Governance -Constitution, Political System, Panchayati Raj, Public Policy, Rights Issues, etc. - Indian & world Geography -Physical, Social, Economic Geography. - Economic and Social development of India. Sustainable Development, Poverty, Inclusion, Demographics, Social Sector initiatives, etc. - General Science and issues related to Environmental ecology /Climate Change/Biodiversity/Art & Culture. - Current affairs of national/international importance. Do only 9-Booklets are sufficient for my GS Prelims exam? Yes, these 10-Booklets are sufficient for GS Prelims exam. Out of These 9-Booklets we have first 5-Booklets which cover 6th to 12th old & New NCERTs & 70+ Major books like Laxmikanth, DD Basu, PM Bakshi, & more. And 3-Booklets of Current Affairs which covers 14+ major sources like The Hindu, PIB, Indian Express, ET & more on daily basis. You don't have to read anything else. Just read our 9-Booklets again & again & practicing questions. That you are taking Guarantee of 70+ Questions in GS Prelims. So do you have any material/proof in order to show case that you have done the same in past? From last 10 Years we have been delivered 70+ Question every year since 2008. We upload Questions every year within the 2 -3 Days of GS Prelims Exam. You can check on our website in our performance section, we upload question paper & which question appear from our which booklet no. & page no. As well & how many questions came from our 9-Booklets. This year we also uploaded Screen shots of pages also. Do they cover Conventional & Current in GS Prelims Booklets? Yes, we cover Conventional & Current in GS Prelims Booklets. We have covered the Gist of 6th to 12th old & New NCERTs & 70+ other sources like Laxmikanth, DD Basu, PM Bakshi, & more. And In Current Affairs part we have 3-Booklets of Current Affairs which covers 14+ major sources like The Hindu, PIB, Indian Express, ET & more on daily basis. I can pay my money in Instalments or I have to pay it at one time? No, you have to pay all the money at one time. If you're using any Credit Card, you can convert them into EMI. Your 5 Tests are Online or Offline? Our 5 Tests are online which is on Full syllabus covering all conventional subjects as well as 25 -30% Current Affairs. What is the Dispatch Schedule of Current Affairs/ how you will be sending Current Affairs books? CrackIAS Test series are available Offline or only Online? We have only Test Series via Online mode. Can I give test according to my preparation/Can I postponed the test if I am not able to appear on given the Scheduled date? Yes, you can give test according to your preparation. You can postponed the test but you cannot Preponed the test. You just send the message request on our E-mail at the time when you can give test. What is the schedule for Test Series? We have given schedule broacher on our website. Just download the brochure of Test series. In the brochure we have given the full schedule for Test Series. Will I be able to download the tests with Explanations after giving them Online? Yes, you can download the tests with Explanations before the time of Prelims Exam after giving them online. How & When I will be able to see the result of my given Tests? The moment you will finish your test & submit it, you will find a button to view your result almost immediately. While giving the test if my internet breaks, would you provide me a chance to complete it? In such rarest cases, you need to send your formal request on crackiasquery@gmail.com, stating your peculiar problem. We will respond back favourably after understanding your genuine request. The Result provided to me will have rank & Explanations? Yes, you will get your rank among those attempted that particular test. We provide a detailed result report on 11 parameters, providing not only explanation on each question but also it will provide you question by question Analysis how you performed. Yes, you will get your rank among those attempted that particular test. We provide a detailed result report on 11 parameters, providing not only explanation on each question but also it will provide you question by question Analysis how you performed. Like your GS Prelims Notes, are your Test Series for GS Prelims also have good performance record in UPSC Exam? We have conducted a dedicated GS Prelims Tests Online in year 2017-18 and has been successful in the very first year only. There were 37 Questions came directly from our GS Prelims Test Series having total 3100 Questions in 31 tests conducted during a given period. How many Booklets are there for GS Mains? Do they cover all 4 GS Papers Syllabus? We have 14-Booklets for GS Mains. 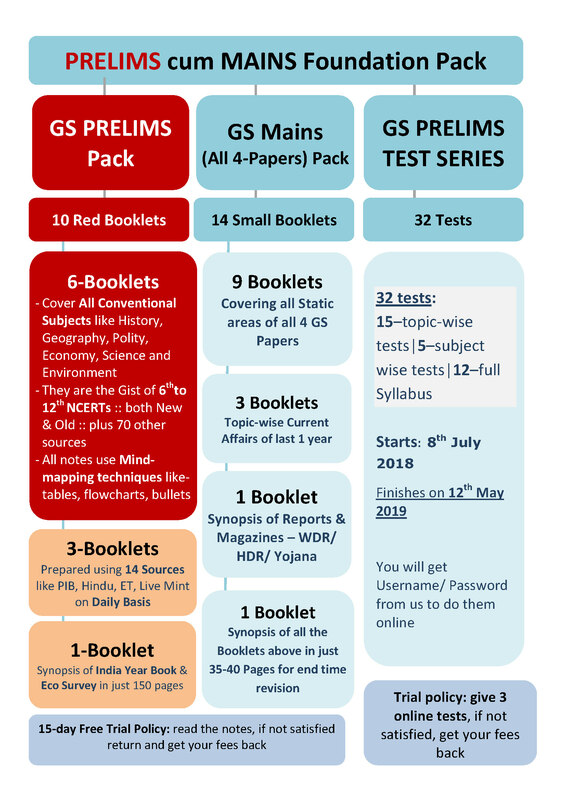 Yes they covers all 4 GS Papers Syllabus As we have first 9-Booklets of static areas which covers all 4 papers of GS Mains & 3-Booklets of Current Affairs, 1-Booklet of Synopsis of important reports & 1-Booklet Synopsis For last time Revision. What all these 14 Booklets for GS Mains covers? We have first 9-Booklets of static areas which covers all 4 papers of GS Mains & 3-Booklets of Current Affairs which covers the period of last 1 year. Every 4th Month you will get 1-Booklets of Current Affairs. 1-booklet of Synopsis of important reports like Human Development Report, World Bank, Yojana & Other Government Reports. 1-Booklet Synopsis For last time Revision in just (35-40 Pages) covers each topic. How much Syllabus you are covering in all 4 Papers? As per the UPSC Syllabus & Guidelines we are covering all 4 papers of GS Mains in our 14 booklets. Paper 1- Indian Heritage/Culture, History and Geography of the World and Society. Paper 2- Governance, Indian Constitution, Polity, Social Justice and International relations. Paper 3- Science & Technology, Economic Development of India, Bio - diversity, Environment, Security and Disaster Management. Who prepared these notes/what are the sources? Our team of Experts prepared these self study notes with the changing of Facts with the help of IAS Toppers. We prepared these notes from 6th to 12th old & New NCERTs & 70+ major books. Is it sufficient material to clear Mains? Yes it is sufficient material to clear Mains. You don't have to read anything else. Just read our 14-Booklets again & again & spend more time on Answer Writing. Can I buy your Mains material after my Prelims Exam? Please suggest? Yes u can buy Mains material after Prelims Exam, but I will suggest to you that you should go for Mains material with Prelims material, as you know the Mains Syllabus is so Vast. After Prelims Exam time is very less for Preparation of Mains. In all your booklets you are covering Static & Current Affairs both? Yes, we cover both Static & Current in GS Mains Booklets. We have covered the Gist of 6th to 12th old & New NCERTs & 70+ other sources like Laxmikanth, DD Basu, PM Bakshi, & more. And In Current Affairs part we have 3-Booklets of Current Affairs which covers 14+ major sources like - The Hindu, PIB, Indian Express, ET & more on daily basis. What is the volume size of your each 14-Booklets? The Volume Size of each 14 Booklets is 250 average pages. What is there in GS Mains Package? We have first 9-Booklets of static areas which covers all 4 papers of GS Mains & 3-Booklets of Current Affairs which covers the period of last 1 year. Every 4th Month you will get 1-Booklets of Current Affairs. 1-booklet of Synopsis of important reports like Human Development Report, World Bank, Yojana & Other Government Reports.1 Booklet Synopsis For last time Revision in just (35-40 Pages) covers each topic. You will get Monthly Current E-Magazine of Preceding Month & 8+2 comprehensive Papers for Practice with Model Answers. Do you provide Current Affairs separately for Mains? Yes we provide Current Affairs separately for Mains. In your package you have mention synopsis for end time revision, please elaborate? Our synopsis for end time revision covers all the topics of all 4 Papers in just 35-40 pages. You have lots of pressure near exam. It will help you funnel vast syllabus into important topics to revise. "The question are conceptual. it realizes what we read in the theory and what we observe practically." "I appreciate the effort taken by crack IAS team. Nice job please provide more and more Mains oriented short current affairs notes in books. It was surely very useful." "Very interesting questions matching the difficulty level of actual civil service examination. Keep posting similar questions in the coming tests too." "It was an excellent paper and I liked it very much. The quality of the questions were excellent. Please do it again"
"Prelims materials are matched with the requirement of UPSC." "I find Prelims notes to be excellent. Especially the order and method of presentation makes it easy for learning." "Prelims notes includes important current affairs questions along with subject, which test our depth and understanding of the subject." "Extensive coverage of Mains notes. Appreciated. But Content needs to be a little more in depth. " "I liked Mains material covered in all the books, it carried knowledge to the point and in a brief manner. It looks like a reliable source of information to be consulted in the preparation of civil services." "Prelims notes are well organized readymade notes touching all points of possible syllabus of civil service examinations....Also I have found answers of many questions answers of latest held state public service examinations in crack IAS notes, e.g. - dhupgadh is located on Mahadev hills is question asked in MPPSC 2018 etc. These notes are very well organized to release burden of study. I hope these will help me to achieve my goals in Civil service examinations...thanks for valuable study material at affordable price with quick home delivery." "What I like most about the crackIAS notes is that the presentation of various topics is in a very simple and clear manner.The most important thing is that as far as possible the notes are in point form which makes the reader feel interesting to read and learn about the topic.Wherever required, the tabular form is also used to differentiate between topics. It makes the topic easy to understand. The presentation of Prelims notes till date I have ever seen. Hats off to the hardworking team of crackIAS who have made the lengthier topics easy for us to understand....."
" I relied completely on Crack IAS Prelims notes for CSE(P) 2012 and i must say it was very useful and help me to attempt 73 Q\'s in paper-1.Three things i must mention ,Coverage:-all the topics were very well covered as per UPSC syllabus, Clarity:-Each and every topic was explained nicely 1-2 reading was enough to mug up the whole concept.Time:- I saved much of time which otherwise would have wasted in searching what to read?" "The highlighted words catch the attention easily and help in final revision of the subject. Please continue with this practice. Prelims notes provided by CrackIAS.com are concise, to the point and cover lots of information in few lines. A most remarkable feature is that notes are well synchronized and systematically presented, so they are easy to learn. The content provided in the material is really awesome. This book helps to save lot of time and also very helpful for revision. Thanks a lot for such a wonderful material." "Very comprehensive, time saving for aspirant feeling lost in Vast ocean of information and Books for UPSC exam. Thank you very much for making this topic easier for us. I've subscribed for G.S (Prelims)-2 Sets (one for my cousin). I had qualified IITJEE" 04 without any classroom coaching, from my hometown in Jharkhand. So, I do understand "nothing works like self study". After going though your material. I"m sure to have the requisite to get through CSE." "The notes were very specific, very to the point. There was no irrelevant material. Highlighting important material was also a good step. The fact that a concise booklet covers all important areas from the scoring point of view in exams rather than learning to increase - knowledge is a welcome change. The size of booklets being small helps in carrying them around." "Almost everything (including concise presentation and beautiful printing). Facts of Indian Economy have been presented in a very lucid and interesting way. Dictionary of important terms in Economics section is very useful. Coverage of current affairs is comprehensive. The honest effort which you have made to produce these small 9 booklets motivates us to work harder! Thanks for your effort." " I had taken crackIAS.com prelims notes and I have cleared prelims. It was very useful and it did provide valuable inputs with wide and depth coverage of topics. As far as conventional topics r concerned like geo, history, economics, crackias materials are the best as it gives basics of a topic and fine details and facts in tabular from which is easier to recollect in less time. Infect current affairs module was also well done to better the understanding and for remembrance too. crackias material added value from my preparation and helped mo to crack prelims. I would like to thank you guys for this." "I have found Prelims notes quite nicely compiled. Everything that is of extreme importance for the exam has been given very clearly in tabulated form which definitely helps in quick revision, understanding and retention. Moreover different sources have been used for the material that definitely would give an edge over the others. The notes on India Year Book are extremely time saving!" "The way Prelims notes have been structured is pretty good. To complete a huge domain of study materials in relatively less time requires to the point, exam-oriented notes and CrackIAS has taken care of that. The Polity, Science and Tech, current affairs sections have been a well gisted. In History, the Modern India part has been covered well keeping in mind its importance in the exam. As a whole, so far I have found it to be quite helpful in all respect." "Prelims notes are very good and very helpful... Really it's very to understand all the chapters in the summarized way... Really its good.. Full details covered and necessary information has given to learn in short time... Specially I liked polity booklet most as it's too easy for me to summarized all d chapters.. "
"They are very informative, relevant and up to the mark. language is simple and easy to understand. they are helpful in building confidence in me also..these notes provide me with some additional knowledge also related to environment change i enjoy alot reading those topics.. thank u for these notes..n keep it up for future.."
"Prelims notes are precise and concise in nature. It covers all the required information for the exam. The highlighted texts help a lot in covering all the important points and not missing any." "Everything is under one roof. Even NCERTs books are also covered. I liked all the GS books, if anyone can remember the facts then it?s just enough for prelims." "I purchased the preliminary material as I was very puzzled to see the huge syllabus. CrackIAS provides a quality study material which is very up-to-date. If someone follow their material seriously then he/she need not to worry about prelims. The booklets of current affairs are also helpful." "It is a good institute for the IAS and all notes and question papers are good because Prelims notes are gist and very simply way and important current events send your link and sms and I like your all notes thank you." " It is very glad for crackIAS.com to provide suitable material for UPSC prelims. Enough content has been provided. As a beginner it is very easy understanding of the course material provided by you." "I appreciate the effort taken by crackIAS team. Nice job please provide more and more prelims oriented short current affairs notes in books. It was surely very useful." "I liked your Prelims notes very much as they cover all the syllabus and are very comprehensive. Soon I am going to purchase Notes for mains..I am sure I would not have to purchase any book any more." "There is nothing to tell about crackias Prelims notes,its all perfect, everybody knows it but i am here to say my heartly thanks to ANIL SIR..he is the best guy i have ever meet. I am not getting a single word to regard him. Aspirants just call him and all your answers would automatically infuse to your mind..he is the best, thank you sir!! will make you proud one day by anyway.."
"Respected team of Crack IAS, I would like to appreciate the entire Crack IAS team for their Whole Hearted effort in preparing the Crack IAS note books on various subjects Viz., History, Geography, economics, polity and Science, that meets all the standards and requirements of new UPSC syllabus for CSP exam. Every book has covered the entire comprehensive syllabus and presented in a very Lucid and precise manner." "Prelims notes are stupendous, well structured and quite informative at par with the changing pattern of UPSC. All the exceptional and important points are highlighted and tabled wherever necessary. I would like to thank CrackIAS for their endeavor in helping students to take the test with full confidence and deep knowledge as well as understanding." " I consider I am lucky to be the part of the wonderful world of Crack IAS. The systematic presentation of notes which frame in such a manner for the clarity of knowledge and easy revision. The proper ordering of facts in a well arrange manner will sharpen our skill in the upcoming preliminary examination." "The booklets have been designed very precisely and upto the mark to cater to the requirements of the GS paper. It fulfills its purpose to provide the vast subject to GS in a structured and useful manner which also helps in quick learning and retention of the subject thereby avoiding unnecessary wastage of time in searching for facts in various books. " "Completely new introduction in G.S Prelims syllabus i.e Rights and Issues, climate change, biodiversity, economic and social development, environment and ecology, demography, etc., have been comprehensively and meticulously dealt with. All the general topics were extensively prepared and important topics were intensively prepared." "Excellent; they are comprehensive and very well designed one. Certainly you people have spent time on these Prelims notes, for that HATS OFF TO YOU. Your notes are so good that I cannot suggest more improvements as they are already better. Thank You." "This is the first time I am enjoying reading History. Wonderful effort, Keep it up. Prelims notes areclear with no ambiguity. Language used is simple and lucid. It had covered almost everything pertaining to subject." "I feel that Prelims notes are really upto the mark. Your work is absolutely commendable. The material covers almost everything and in fact, the notes were very useful in solving questions from various other books. The standard is excellent helped us to a great extent. Especially will be useful in last minute revision." "I find Prelims notes are very good for preparation. The way you have summarized it is very nice and it will help in faster grasping of the subject. I am very happy with your notes"
"Bold and italicized important points. Precise yet useful information in exam point of view, Readable font size, Tabular forms giving an overall view of subject, Appropriate weight age given to CURRENT AFFAIRS. Small yet informative booklets of Prelims facilitating ease in study." "Prelims notes has a complete summary... Al the imp points have been covered in a very systematic manner.Thank u Team"
"I want to give thanks to your support team for providing Prelims study materials to achieve our goals. thank you"
"I am receiving good help from CrackIAS.com for my G.S. Prelims Part. It has a good coverage of all information regarding G.S. exam which is compact, comprehensive and easy to remember." "I subscribed only Pre material at this time. I comment only that it's the best compared to any other material." "G.S. Prelims notes are simple, concise and short. Makes revision much more easy, apt material as accordance to UPSC. The facility to scan QR code helps to build understanding the things more perfectly. Thanks.The parts including economy needs more elaboration as such concepts are implicit and needs to be more explicit. " "Prelims notes provided was crispy and to the point. Helped to boost my preparation. Current affairs notes was the best i liked which helped me a lot for my exam." "G.S. Prelims notes are compiled in well classified manner which makes it easier to compliment with the basic books and the comprehensive nature of the notes also enables one to cover the syllabus easily." "CRACKIAS.COM note has help me in my GS Prelims preparation, some of the GS topic which were not come across in other source were found in crackIAS.com note, thank for meticulously planned the GS topic." "The notes of history are brief and just right. And the economy includes all current and traditional in a compact way. For geography the information found incomplete sometimes but good after all. Current affair and India today notes seem institute had done a good job." "Prelims notes are good. Very beneficial for the aspirants.Well written.Comprehensive.Content is significant. Thanks, Keep up the good work." "The all nine books are beautiful compilation of GS and Current Affairs. And above all the content of GS is multi sourced that makes it more reliable." "Quite concisely written.Prelims notes are easy to revise. Current affairs is quite good and very sufficiently and efficiently covered." "Prelims notes are comprehensive and precise. Very helpful in preparation for all competitive exams. Thanks a lot crackIAS.com team." "CrackIAS.com is the only answer of all the questions. It is a panacea for a civil service aspirants and the time of dispatch and the staffs and faculties are so helpful that one's panic goes far away when he talks to them or reads Prelims materials." "Prelims notes are quite attractive and they become more important because almost 85 to 90% of all books/ notes you get in one booklet. Amazing. Secondly, the important points are already highlighted so you need to look into them first and then the others. Great." "Concise Prelims study material. Exhaustive coverage on geography and economy. Easy to remember notes due to use of tables, points/bullets etc. Almost perfect proof reading with very few misprints." "I would like to thank you for these beautiful Prelims notes. These are very good supplements. Basic knowledge of the subject and your precise notes make easy to solve the questions. I like the extra facts which have not been found anywhere else in my resources. Thank You." "I would like to thank you for providing such a nice and precised Prelims notes. The quality of these notes is a way ahead from others which helps us to have an idea of what to take up and what to delete from exam point of view. On the whole I solemnly say that Crack IAS is a FANTABULOUS Book." "Short to memorize and understand.. Very good for preparing in short time. Have already sent few rectification needed in WhatsApp..after exam I will send a consolidated one to help our team crack IAS.."
"Prelims booklets cover all the relevant issues. They are precise and comprehensive as well. The notes are very much exam oriented and saved a lot of time. Thus have helped immensely to garner more knowledge. I am very much thankful for innovating such a process." "Prelims notes are just excellent well prepared and very much helpful for an aspirant of civil services. Each point is explained in a good manner and the maps are just very good." "Prelims notes are very precise and concise, thus making it a very effective material for revision purpose. Presentability is good as it enhances retention. Excellent." "Prelims notes are good, to-the-point and well arranged. If there is any book or reference material that can be used to enhance understanding of given point in the material, please recommend them at appropriate place." "Prelims notes are concise, exhaustive, exam oriented. It has taken care of the number of books that one is required to buy." "Superb work in the part of Prelims, thanks a lot for your help in very short period of time." "Prelims notes are very useful for the final revision part. Worth purchasing the pack." "Prelims notes are to the point and easy for revision." "The work is very good and compilation done by crackIAS.com is one of the best. The 9 books have all the information with respect to prelims." "Great notes. Well arranged. All related topics in 9 booklets. Appreciable efforts by Team Crack IAS. " "Prelims notes are easy formulated. Newcomers are able to grasp the detailed information readily." "This websites help a lot in Prelims preparation. Mainly the topic regarding The Hindu." "Prelims notes are to the point, have smart presentation, cover all of pertinent areas." "All is that crackIAS Prelims notes have covered every topic listed in UPSC syllabus." "Prelims notes are precise and Concise..Time Saving ... Most Important: Cost -Effective.."
"The way the Prelims notes have been structured.Every point is relevant and useful from question paper point of view. The Set V of General Studies was highly competent compiled material." "The Content provided in all the Prelims books are very relevant and each topic has been appropriately covered." "Prelims notes on Indian Polity and Current Affairs are really good, and I believe that they have no competitor." "It is just like synopsis and easy to refer. The quality and quantity of Prelims notes are absolute (i.e. outstanding). I am 200% satisfied about the notes." "Prelims notes are very good & well compiled and imperative too." "Prelims notes so far received are brief, concise and a storehouse of a lot of knowledge." "Prelims notes are very compact and written in a lucid manner, easy to grasp." "Dear crackIAS.com teamI honestly did not follow any sort of notes provided by this platform thus I cannot comment on that. But I joined crackIAS.com test series for prelims 2018 and I am really happy with the one. The level of mock tests is thoroughly what UPSC is all about. The appropriate portions of questions from each and every possible section are included. This not only helps you to understand your preparation level but also insures that you put a bit extra effort to perform better in your exam. I am satisfied with the test series and I am looking forward for the new initiatives that this platform will be starting to help aspirants. Thanks to the crackIAS.com team for giving such a wonderful platform." "This time paper was really good and upto the standard as per the UPSC.Questions were covered from all the areas and had an depth of surprise as well as important related infogood work team crack ias"
"The quality of questions in the paper is really very good.The questions are logical and hence helps in clearing the concept.Also the result analysis is reaaly good.so this test series i think will be a path to success for me and i will definately join this test series." "While reading a book without testing, you cannot be sure that whether you are reading it in the right way or not, that is, which points are crucial. Many a times, we need to read between the lines; this can only be assured through practicing tests. Sometimes what we perceive about a topic after reading it is not the truth - this is tested through practice tests"
"It could be more mobile friendly that could be more advisable to ur ends. Subjective questions could be added more to the questions paper.for enhancing difficulty level options could be more enriched.overall satisfactory paper designed by the crack IAS"
"Good experience to know the score. will definitely help in knowing the current events. the format in the line of upsc papers. static part was a bit confusing.Level of questions maintained throughout. thank you"
"Your checks in depth knowledge and bring out our weaker points." "Test Series is really good. it is appreciable. it has a wide range of questions from the concerned subject. the level of questions ranges from easy to hard. A good amount of coverage of current affairs. Loving it." "This test series is owsummm. It is helping me day by day to get through the toughest exam of india but i have to improve a lot. I request to crackias to continue their services like forver in future to help people to enrich their dreams & convert them into relaity. But They will also have to work hard"
"I would recommend Crack IAS mock test series to anyone who is sincere about their preparation. mock tests are very crucial to one's success in competitive exams and a good platform for taking tests is essential. The questions are very well set, they follow the UPSC patter, well balanced with Easy, medium and difficult questions. " "The test series is covering every aspect holistically.Basics are being given special attention and NCERTs has been covered very well. Also current affairs is included in every test and hence basics and current aspect is going parallel.Options given are very similar to upsc pattern and it is not easy to give answer by only guessing,"
"It helps me to know about my preparation and aware about where i lack.i found a lot of difference between my preparation and crack,s.i know it helps me and very useful for my GS"
"It's good to come back and revise the concepts once you have cleared them on your own. This report keeps me on the track and I again pick up the book and work." " I appreciate the efforts of the Crack IAS team of providing the details of questions covered in the Test Series that appeared in Civil services preliminary exams annually. It really boost morale and gives an Inspiration for more hard and smart work. I wish all very best to the entire team of CRACK IAS, including The director sir, Anil sir, Vijay sir. Thanks and regards"
"I would recommend Crack IAS mock test series to anyone who is sincere about their preparation. mock tests are very crucial to one's success in competitive exams and a good platform for taking tests is essential. " "Highly good, covers the whole syllabus easily,very regular, up to the level of upsc,application based questions as well as basic questions increase the confidence level"
"This test series is really eye opener. After given the test one should analyse the preparation of the exam. This test series is really effective with regard to original exam. After taking this kind of test series it could be possible to determine the loop holes in preparation." "This was good ..... the questions seems product of well research . Even the options are also at per with upsc. It makes me work even harder. If you could provide current affairs every week that would help us ." "Questions are from all the sections and are of different level..most of the questions are application based and are based on current issues." "While reading a book without testing, you cannot be sure that whether you are reading it in the right way or not, that is, which points are crucial. Many a times, we need to read between the lines; this can only be assured through practicing tests. Sometimes what we perceive about a topic after reading it is not the truth - this is tested through practice tests." "Level of questions was really tough.the standard of the paper was same like UPSC. No of questions from current affairs was more in number"
"The question paper covered a wide range of topics. The mix of questions is good. Current affairs based questions were from various fields." "The questions were of good standard which i liked a lot. hope to do better next time. thank you. looking forward to solve more papers like this." "Very good paper setting. it will help students to review their preparation better. More tough paper needs to be given "
"Both the economics paper had huge variety of questions consisting of inflation,BoP, international organizations. which helped me a lot knowing different functions "
"Questions are good... Though I didn't manage a good marks but the standards are very good... Compilations of current affairs with the questions re also very helpful." "Notes are really awesome, it is very precise, crystal clear and easily understandable.It covers everything which is necessary for the exam. More questions needed for the practice." "The questions are very innovative some of them are known but most of the mare new very good overall liked the arrangement of questions "
"Questions are very good. Help to memories the concepts and improves analytical ability. Thank you for this good paper." "The crackias team is doing great and the test series created by them is really of good level and they deserve appreciation for that. keep the level of the test same. Thank You"
"It's good and excellent is IAM glad to thank u for providing such tests it's really improve my talent." "Question paper covers all the fundamental concept of each topic of every subject, very comprehensive coverage of current affair.questions level are up to the mark.Answer are discussed very comprehensively." "I like the online platform to take the test and the detailed numerical analysis of my performance. I also appreciate the total time gap of 47 hours given to take the test." "The crackias team is doing great and the test series created by them is really of good level and they deserve appreciation for that. keep thelevel of the test same .thank you"
"Specially the questions on current affairs were very good with good coverage of events which are in news currently"
"Good questions. Simplified explanations. Good for Revision, all book covered under test series "
"Good for aspirants want to crack this exm , ex lent quality of questions , kindly add more current related questions ..."
"Majority questions from ncert compels to read the book in a deeper way. These test are really helpful." "Well, one of the best test serice i ever refered it is like upsc current trend ,and question are highly markeable"
"Nice one to question in polity...hope to get more interesting question in the upcoming all the exam..thank you"
"TEST WAS GOOD AND WELL BALANCE WITH CURRENT AND STATIC PART.BUT OPENING UP ANSWER KEY TO MARK EACH QUESTION WAS CUMBERSOME.Lets see result and plz provide some more free tests"
"Awesome test paper , i enjoyed all questoion because more than 45+ question pickedup from the hindu news paper. " "Good questions. This was as per upsc. Thanks again for all the questions. Toughness level has increased now in the last test as it approaches." "In this paper all questions were very nice and thus cover the all subjects and current affairs and thank you"
"This test series is owsummm. It is helping me day by day to get through the toughest exam of india but i have to improve a lot....."
"I expected my score more but disappointed with myself. Test was really good questions are well mixture of simple moderate and hard confusing options very well organised "
"It is a good experience for aspairants ..It will definately help to qualify in the examination. Thanks for it..."
"Appropriate questions were there taken from various topics.questions were based on factual.every topics were taken care of." 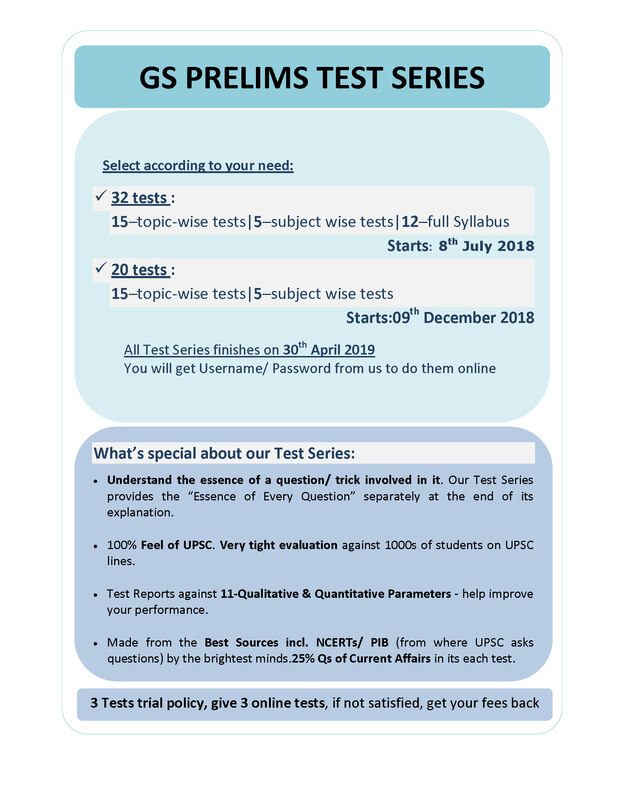 "The content of test series is on the lines of upsc..n value based explanation ..this test seriesis really good and we are thankful to u"
"It is important for revision as well as Very useful for prelims for those who r preparing for civil service examination.thank you"
"I have this test series very much... It has helped me very much... It will make me able to get my dream success in reality In near future... I am really applaueded by this test series?" "The Questions were well prepared and the test simulated the actual test. The questions of CA are of good quality"
"Format of the paper, difficulty level, nature of questions, good amount of questions from current affairs"
"All the questions prepared are up to upsc standard. Liked the way the questions are prepared easy , medium,hard level. Work nicely done." "Questions selection from all areas just like upsc and really good questionsAnd from polity and history also question was good"
"The content of test series is on the lines of upsc..n value based explanation ..this test series is really good and we are thankful to u"
"It is very good test series.The questions have a wide range covering the relevant current affairs as well as traditional questions." "Test Series was good. It has a wide range of questions based on Environment." "It was an excellent paper and I liked it very much. The quality of the questions in Test Series were excellent. Please do it again"
"Current awareness questions are good. Thank you very much for providing questions in UPSC pattern." "I LIKE THAT IF SOMEONE HAS FAILED TO TAKE TEST THEN IT HAS TO BE REMAIN ACTIVATED FOR THE INDIVIDUAL TO TAKE TEST"
"Different combination and level of questions,wide area of topic covered,differentiation of tests into category"
"Diversity in questions and in-depth knowledge required to answer which boosts the zeal to study more and focus more on the target." "It's a good test series.. Questions are good and please provide in detailed explanations of questions"
"Gave the experience of real testand the questions were current affairs based"
"The variety of environment questions are designed as per UPSC standards." "Pattern of questions speedometer and on the same lines of upsc..thank you so much crack IAS Team.."
"The paper was as per the requirement of civil services examination testin the nitty gritty of the subject concerned"
"Current Affairs based on Environment was expected. Some Questions were out of the topic as mentioned. It would be good to solve ques only on Environment. " "In depth coverage of current affairs. most of the questions are like i have heard about them but are not very sure." "Thanks a lot crack ias..its really very good platform for those who are preparing for civil service "
"Tough and selective question.Very hard to attmept.But it is such a very good collection of question." "Superb notes coverage of current affairs is good the current concepts are will be very much useful for mains. I request Crack IAS to provide the current affairs covering all aspects so that the aspirants can solely rely on the provided books instead of wasting time in reading too many books"
"G.S. Mains notes content is extremely precise and accurate . As very helpful to me." "I am really impressed with the way G.S. Mains material formulated ... A very big thanks to CrackIAS.com team for simplifying the material and making it so reader friendly." "Mains notes are very specific, cover a lot of areas, for which a lot of time & reading would have been required." "They are authentic, time saving and most of all it saves times while memorizing so many books. Just one thing about CRACK IAS, Mains notes are just like a beam of light for a UPSC candidate like me who want to follow the path of success." "I liked Mains notes provided by CRACKIAS because: Each and every subject has been presented point wise, yet they are elaborate, and the main terms are highlighted. This elaborate and point wise presentation makes me feel that the notes can be finished within a short duration, that helps a lot psychologically." "Mains material is relevant. The background of pages iss too dark. The words are not exactly visible. Quality of pages is also not good. But content wise, it is very good. " "I enjoyed to read Mains notes. This notes most important and better for last one month before exam." "I am really impressed with the way the material formulated ... A very big thanks to CrackIAS team for simplifying Mains material and making it so reader friendly." "Mains books have extremely helped me a lot in my preparation .Try to include as much as possible topics.Keep up the great work .Thank you"
"Mains notes has perfect data of previous questions and current also, provided graphs and diagrams which are very useful "
"I liked the material covered in all Mains books , it carried knowledge to the point and in a brief manner . It looks like a reliable source of information to be consulted in the preparation of civil services"
"Everything in one place. Saves the pain of going through several books. " "Crack IAS Mains notes touch every imp topic acc. To UPSC.Approach to topics is very relevant and all the previous year question papers are given at start of every topic which is great." "Mains notes are comprehensive and precise. Very helpful in preparation for all competitive exams. Thanks a lot crackias team." "The sequence of contents of Mains notes is quite praise-worthy. The notes have covered almost all the relevant issues as well as updated information." "Mains notes are compact, to-the-point and presentation is also good. Especially useful for ones those who are new in this field. Turning through the pages what caught my attention most were the meticulously crafted boxes and tables which could serve as ready reckoners." "All Mains notes received so far were very precise and Lucid, at the same time complete in content. Presentation of the material in pointer forms made my Revision work dawn easy and also consolidated the things I had already learnt in detail." "Mains notes prepared by you are so beautifully outlines, facts and figures are nicely given, and the most I like is the table format which gives the skeleton as well as muscle to the information. It is precise and relevant. Everything is fine and nicely prepared." "Being a "Child" in "this" world, I'm not a person to say about the quality of the contents in these Mains notes. But I may say my feelings and experiences. I found it easy to study and to revise. Ease in handling. I found a great coverage and a strongly or highly appreciable endeavor. " "I appreciate the painstaking efforts to have provided a masterpiece of exemplary work. It has significantly helped by organizing the relevant resources shattered and dispersed in voluminous G.S. Mains notes." "Mains notes were very well prepared and were providing a comprehensive knowledge and information about the topic. They depict the professionalism and hard work of the minds and hands behind their preparation. I hope that the rhythm would continue unhindered and for a longer time." "Mains notes are very good & well compiled and imperative too." "CrackIAS Mains notes are really good,concise,to the point,don't have to refer 10 books,everything is in just one book.These booklets helped a lot." "Mains notes have benefited that in a singal package there was everything,Current Affairs broadly covered,so no need to go anywhere." "Great Mains material...... It has made my preparation of civil services more directed and saves my huge time. Thanx"